WASHINGTON – Twenty years after the end of the Persian Gulf War, the Department of Veterans Affairs plans to standardize and improve treatment for the one of four veterans who suffer from a multisymptom illness that could have been caused by environmental exposures. 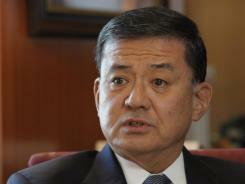 Veterans Affairs Secretary Eric Shinseki says lessons will be applied to "veterans of all eras." Colon Cancer Diagnosis?Distance Should not be a Factor. Military School BenefitsReduced Military Tuition Rates. The VA has created a pilot program starting this week inSalt Lake City aimed specifically at caring for Gulf Warveterans, and it vowed to improve training, data collection, research and communication for that group. The department will distribute pocket cards explaining symptoms and possible exposures to medical staff. The VA has created two positions in the Office of Research and Development to deal with health-related issues possibly arising from the Gulf War or other deployments. A report, released by the VA's Gulf War Veterans' Illnesses Task Force, lays out a proposed plan to address veterans' concerns. "This report provides a road map for our continued enhancements in our care and services we provide to Gulf War veterans," VA Secretary Eric Shinseki said in a statement. "We will be applying lessons learned from this report to veterans of all eras." The proposal comes after years of research that mistakenly pointed to stress as the cause of symptoms such as chronic fatigue, headaches, muscle and joint pain, chronic diarrhea and mysterious rashes. Last year, the VA issued a 32-page training letter documenting possible environmental exposures found during the Persian Gulf War and in the current conflicts in Iraq and Afghanistan that could result in troops' illness. Those exposures included burn pits that consumed as much as 240 tons of trash a day, particulate matter from dust storms and carcinogenic chemicals left behind by Iraqi troops. Recent research has shown a connection between Gulf War veterans who used pesticides and anti-nerve-agent pills to veterans who have higher rates of Gulf War illness. "As a Gulf War veteran, I'm glad that our issues are still on the table," said Joe Davis, spokesman for the Veterans of Foreign Wars, a veterans advocacy group. "With the dust, the oil fires and the burn pits, it's just a given that some people are going to have a stronger reaction." Davis commended the VA for being "light years" away from how it responded to ill veterans 20 years ago. Recent research has shown that veterans' symptoms resemble those of rats exposed to nerve agents and pesticides. A recent study showed that some vets' symptoms responded positively to treatment with the antioxidant coenzyme Q10. Researcher Beatrice Golomb of the University of California-San Diego said she expects more good news for potential treatments within the year. Davis said he expects that research, as well as the proposed changes at the VA, will further help change the mindset of people who discount the disease. However, the new VA report doesn't suggest any new research and shows that Gulf War illness funding dropped from $41 million in 2001 to $17 million in 2010. The report quotes from a 2009 Institute of Medicine study that called for "a renewed research effort with substantial commitment to well-organized efforts to better identify and treat multi-symptom illness in Gulf War veterans." It's a good program aimed at improving the health of the veterans. At least they can still continue doing the activities they love to do even when inside nursing homes in new jersey. This is great news for all veterans. I do hope that they implement this kind of medical service to all elders including those in retirement communities New York.